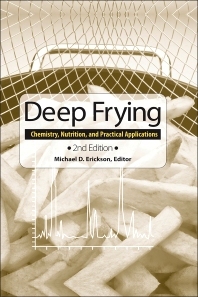 Since the first edition of Deep Frying was published in 1996, there have been many changes to the U.S. Dietary Guidelines and nutritional labeling laws, and improvements in frying technology and practices have made a significant impact on the industry. This book covers everything you need to know to create fat and oil ingredients that are nutritious, uniquely palatable and satisfying. Michael D. Erickson spent time as a Technical Service Manager for Cargill Dressing, Sauces and Oils in Fullerton, California. He started his career in 1981 with Interstate Foods Corp., Chicago, IL, which, at the time, was the sole supplier of frying fat to the McDonald’s system. He worked closely with the largest international quick-service restaurant chains and food processors as primary technical lead for matters related to frying including product development, equipment evaluation and education. In 1990 he started work for Humko Oils division of Kraft Food Ingredients in Memphis, TN, where, in addition to continued work in the frying industry, he led various projects including alternatives to hydrogenation and identification and development of biotechnology oil through the partnership with Pioneer Hi-Bred International, Inc. He also worked extensively in edible oil processing on projects involving new refining technologies and identification of productivity opportunities in each unit process (refining, bleaching, hydrogenation, deodorization, winterization). His work at Cargill included continued active participation in the frying and frying related industry in addition to pioneering product and service support for unique customer solutions involving any food ingredient. He is a member of the American Oil Chemists’ Society having served as the technical chairperson for the 1993 Annual Meeting (Anaheim, CA), and member of the AOCS Governing Board. He developed and chaired two AOCS Laboratory Short Courses on Frying Fats and co-chair for frying fat sessions with Dr. Perkins.